Imaging sitting on a luxury yacht and cruising around the world, sipping cocktails and generally having the time of your life. 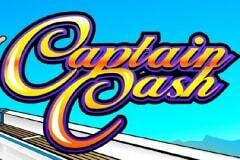 Well that’s the theme behind Captain Cash, a classic 3-reel pokie from Microgaming that wants to give players a reminder of what riches can buy. Poker machines like this will either appeal or not, so if it’s multi-round, complex video games that float your boat, then Captain Cash won’t be for you, but fans of 3-reel games will find this reliable and easy to play, with a high-paying wild symbol to add a little variety to the spins. Like most games of this nature, it’s all set out on a single screen, with the reels off to one side, a paytable on the other, control buttons below and images that set the scene taking up much of the rest of it. Captain Cash is a distinguished gentleman, sailing around and looking like he’s having a good time, as you would if you had your own yacht to spend the day on. To get started, players need to select how many coins they are going to stake, whether it’s a single coin or all 5, with each extra one activating a line. There’s 5 lines, 3 of them running horizontally across the rows of symbols, while lines 4 and 5 run diagonally, which is all fairly standard for this format of pokie. Players then need to decide the value of coins per line, with a range of 0.25 up to 20.00 being available for a total maximum bet of 100.00, which is pretty substantial and makes Captain Cash a game suited to just about any budget. Simple + and – buttons along the bottom of the screen will adjust the value of the coins, while players choose the number of lines using the Bet One button which also highlights the paytable to indicate which lines will be played. The symbols couldn’t be more traditional if they tried, with single, double and triple-bars dominating, plus there’s the Any Bar feature that helps to bring in extra wins, and a bright red 7 which is the highest paying regular icon. The paytable details how much players will win should 3 identical symbols stop on one of the paylines that they have a stake on, with any combination of bars rewarding them with 4x the amount wagered on a line, going up to a nice 80x should the 7 symbol land in the right places. A smug-looking image of the Captain giving the thumbs up is a wild symbol, boosting bankrolls as he substitutes for any other and thereby makes it easier to get a winning line. The real advantage of the Captain however is when he fills one of the paylines on his own, as this rewards players with the biggest wins by far. Depending on which line he fills, there’s payouts of between 1000x and 5000x the amount wagered per line, maybe not enough to set sail around the world, but at maximum bet that’s equal to 25,000.00. OK, so hitting that perfect combination is going to be pretty rare, but the chance that the very next spin could be worth a small fortune is the whole appeal of these games. Is Captain Cash Nautical or Nice? Simple gameplay and a pleasing design is about all players could wish for in a 3-reel pokie, and Captain Cash delivers on both counts. These games tend to feature lots of winning spins, which may not be huge amounts, but it stops play from getting tedious and as there are no side games, free spins rounds, multiplier payouts of other distractions, players can just concentrate on spinning the reels and collecting wins. Of course should our friendly captain turn up in the right places some decent rewards can be claimed, while acting as a wild symbol at least boosts the frequency of payouts.